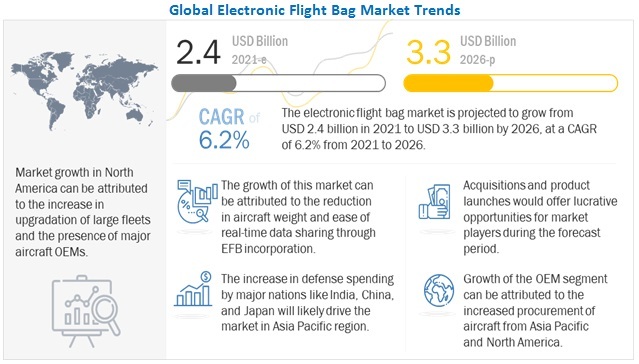 The electronic flight bag (EFB) market is projected to grow from USD 2.73 Billion in 2015 to USD 5.06 Billion by 2020, at a CAGR of 13.09% during the forecast period from 2015 to 2020. The market for EFB is driven by various factors, such as the rising need for accurateness in airplane performance. This report covers the forecast of the EFB market and its dynamics over the next five years, while also recognizing market applications, evolving technologies, recent developments in the market, and high potential geographic regions and countries. The report includes market dynamics, such as drivers, restraints, challenges, and opportunities, along with Porter’s Five Forces analysis and a life cycle analysis of this market. The base year considered for the study is 2014 and the forecast period is from 2015 to 2020. The portable class 2 EFB is expected to grow at healthy growth rate during the forecast period. This type of EFB doesn’t require airworthiness approval, which makes it easier for the pilots to use EFB’s during the flight. Class 2 EFB has the advantage that it can be used during all phases of a flight. Moreover, the hardware required for class 2 EFB is low cost and can be procured from the existing vendor. The market size estimations for various segments and subsegments of this market were arrived at through extensive secondary research, corroboration with primaries, and further market triangulation with the help of statistical techniques using econometric tools. This research study involved use of both, primary and secondary sources. Secondary sources include directories and databases, such as annual reports and Factiva to identify and collect relevant information on the EFB market. Major players in the EFB market were identified across regions and their offerings, distribution channel; the regional presence is understood through in-depth discussions. Also, average revenue generated by these companies, segmented by region, was used to arrive at the overall communication test and measurement of the market size. The ecosystem of the EFB market comprises various component suppliers of the EFBs. Various EFB components manufactures, such as Airbus Group SE (Europe), Rockwell Collins Inc. (United States), UTC Aerospace Systems (United States), L-3 Communications Holdings Inc. (United States) and Teledyne Controls (United States), sell different EFBs to the airline industry. This study answers several questions for stakeholders, primarily of segments to focus over the next five years for prioritizing efforts and investments. The electronic flight bag (EFB) market is projected to grow from USD 2.73 Billion in 2015 to USD 5.06 Billion by 2020, at a CAGR of 13.09% during the forecast period. The major factors for the growth of the EFB market are increase in need for fuel efficient aircraft, reduction of cost and improved operational efficiency, reduction in aircraft maintenance cycle and real-time access to information. The market is segmented on the basis of EFB type and component. By type includes portable and installed EFB, in which the portable EFB is sub-segmented into class 1 and class 2 EFBs. Out of these segments, the portable class 2 EFB market is projected to grow at the highest CAGR during the forecast period. The portability and capability of portable class 2 EFBs are some of the important reasons driving the portable class 2 EFB market. By component, the market is segmented into hardware and software; software EFB is further sub-segmented into portable (type A and type B) and installed (type C) EFB software. The growth in the software component segment is expected to be out of the rapid development in the software of the EFBs. The software developers are focusing on including more and more operations of aircraft cockpit in EFB. North America and Europe are the largest market for EFBs. The large market share is attributed to the large commercial aircraft fleet in these region. Asia-Pacific and Rest of the World (RoW) EFB market are the fastest growing markets. 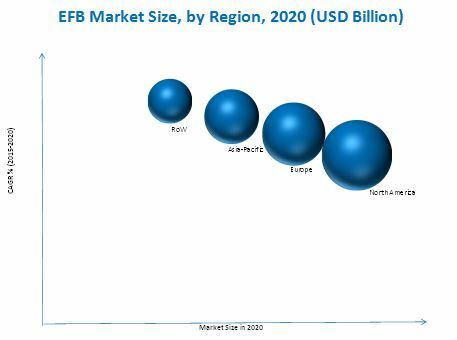 The growth of EFB market in these region is mainly because of the existing low penetration of EFBs and focus on reducing the overall weight of the aircraft to achieve higher fuel efficiency. Some of the factors restricting the growth of the EFB market globally are capital cost involved in the implementation of EFBs, and risk of electronics system failure. The cost involved in the implementation of EFBs is much higher. Smaller domestic airlines avoid implementing EFBs due to the higher initial capital cost involved. Also, the cost of maintaining and updating the EFB software add to the financial burden of airlines, this restraining the market growth. Major players in the EFB market are Airbus Group SE (Netherlands), Rockwell Collins Inc. (United States). The Airbus Group primarily focuses on contracts, which helps them to strengthen the company’s position in the EFB segment. In September 2013, the Airbus introduced new features to its “FlySmart with Airbus” with the aim to gain a strong foothold in the EFB market. After studying the recent developments, we can interpret that the company is more into installations of EFBs in different aircrafts, which shows that the company is generating more revenue from this segment. These strategies have helped these companies maintain their lead position in the market. Airbus is also a leader in the commercial aeronautics segment and plans to further strengthen its market position and profitability. 11.4 L-3 Communications Holdings Inc.